Since nearly 50 million Americans suffer with an autoimmune disease, it’s likely that you or someone you know experience the effects of Crohn’s disesase, Hashimoto’s, rheumatoid arthritis, multiple sclerosis, or something similar every day. If you suffer with one of these diseases, you are likely taking medication to manage your symptoms. However, wouldn’t it be great to remove whatever is triggering your flare up? Imagine waking up with less pain, less swelling, and less digestive problems! That may sound too good to be true, especially if you have been suffering for a long time. You may have even forgotten what it feels like to live without your symptoms! The truth is, many uncomfortable symptoms can be lessened, or even eliminated, by avoiding some very common foods. While every person’s symptoms are unique, there are certain common offenders for those suffering from autoimmune disease. 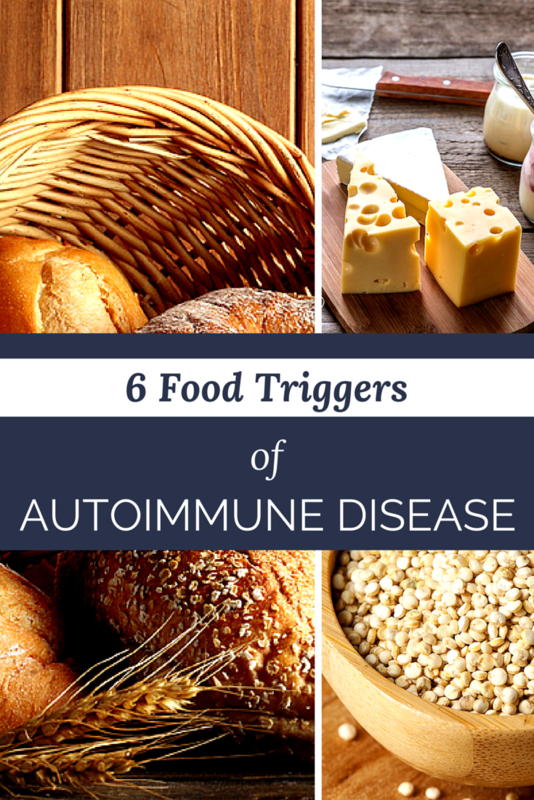 Let’s take a look at six of the most common foods triggering an autoimmune response. It seems there are a couple of different camps regarding gluten (a protein in many grains, such as wheat). One side insists that eating gluten is bad for you. The other reasons that gluten is a food that has been consumed by people of various ethnicities for thousands of years, so how could it all of a sudden be harmful? The truth is, they are both right. Our ancestors ate gluten and remained healthy. However, they did not consume it to the extent that most Americans consume it today. Wheat was also not genetically modified as it is now. Gluten has been identified as a common immune response trigger — one whose effects can take up to six months to recover from! Sugar in any form creates inflammation. This is especially true for refined sugar products. However, even so-called natural sweeteners, such as turbindado sugar and agave nectar, trigger an immune response. You may love your cheese, but it may not love you. The protein called casein is often the offending culprit in triggering an immune response. However, many find that they can tolerate fermented products, such as yogurt, without any issues. Pure, dark chocolate is often touted for its beneficial properties, including its high levels of magnesium. However, milk chocolate often contains little or no actual cacao. If you’re going to indulge, make sure it is with organic dark chocolate, not with the processed candy bars that are located in the checkout line. Many mistakenly pat themselves on the back for avoiding gluten, only to turn to grains such as corn, rice, and oats. These starch-laden grains may be just as bad for you, if not worse. Many of these grains cause a cross-reaction for those with gluten sensitivity — meaning that your body mistakes these grains for gluten, inciting an immune response. Not only does soy mess with your hormones, it is often genetically modified. This means that your body identifies it as an invader and sends out an attack, often on itself. Avoid soy at all costs! Avoiding trigger foods is an important step in managing your autoimmune disease. However, you are probably aware that there is much more to it than that. Now that you know what to avoid, what should you include in your diet? How can you find relief for your symptoms? Are there natural approaches that complement the medications you are currently taking? You can find the answers to these questions, and more, in our latest ebook: Living Well with an Autoimmune Disease. It’s our free gift to you, to help you get on the path to living well with an autoimmune disease!